Dwyer Instruments are a leading manufacturer in the controls and instrumentation industry, they continue to grow and serve major markets including, but not limited to HVAC, Chemical, Food and Beverage, Pharmaceutical, Oil and Gas, Wastewater and Pollution Control. 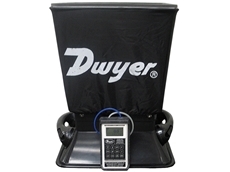 Dwyer’s extensive range of test equipment is functional and specified to many industries. The range includes: The SERIES SAH SMART Air Hood® Balancing Instrument is the most accurate and easy to operate air flow hood on the market. By using the included hood stand and wireless communications to the handheld, a single operator can balance a branch in less time than traditional balancing teams. Besides being lighter than most traditional capture hoods, the ergonomic design makes the Series SAH easy to manoeuvre, with less physical stress. 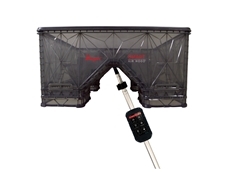 The rugged polypropylene base hood features patented Quad Flow Design Technology for controlling air flow and minimizing back pressure, which yields superior measurement accuracy. The Wi-Fi direct communication gives reliable communication with a distance of up to 200 yards (183 m) between the hood and the handheld test instrument. The SMART Air Hood® Balancing Instrument includes the PredictAir™ Application Software which reduces the number of steps in the air flow balancing process using Predictive Balancing’s Express Balance mode. Predictive Balancing is a method of predicting the optimal flow set point for each register and the order in which they should be adjusted.The SERIES 477AV Handheld Digital Manometer is now available with pressure, flow, and velocity measurements along with a number of other convenient features. The built-in air velocity and flow calculations provide accuracy and conserve time and error associated with manual calculations. Also featured on this unit are adjustable zero and span values for calibrating in the field, as well as a damping feature to compensate for the fluctuating of readings.The SERIES 490A Hydronic Differential Pressure Manometers are versatile, handheld, battery operated manometers available in several basic ranges for positive or positive differential pressure measurement and can tolerate most liquid media compatible with 316LSS. A new feature added to the Series 490A is a field adjustable damping, which allows the user to choose the level of display averaging rate corresponding to the fluctuation level common in many applications.The MODEL 485B Thermo-Hygrometer is a versatile, compact, handheld instrument for measuring percentage of relative humidity and temperature in °F or °C. Dew point and wet bulb temperatures are derived from the relative humidity and temperature measurements and are displayed on the LCD.The MODEL 471B Thermo-Anemometer Test Instrument is a versatile dual function unit that quickly and easily measures air velocity or volumetric flow as well as air temperature in imperial or metric units. A stainless steel probe is included, which has a comfortable hand grip and etched insertion depth marks. The extruded aluminum housing fully protects electronics, yet is lightweight and comfortable to hold.APPLICATIONS Commissioning, testing, adjusting and balancing volumetric air flow from diffusers, grilles, and registers in HVAC systems Duct traverses HVAC inspections Testing and balancing Air flow monitoring Duct static pressureFor more information on Dwyer’s extensive range of quality products, please visit their website. Dwyer’s extensive range is functional and specified to many industries. 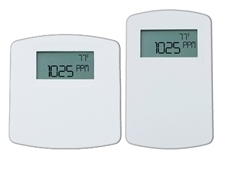 The range includes: The SERIES CDT Carbon Dioxide and Temperature Transmitters accurately monitor the CO2 concentration and temperature in indoor environments to help achieve energy savings. For increased sensor accuracy, a single beam dual wavelength nondispersive infrared (NDIR) sensor is used to automatically correct the measurement in both occupied* and unoccupied buildings against light source aging effects. The single beam dual wavelength sensor technology provides the highest level of accuracy compared to Automatic Baseline Correction methods which can unintentionally shift the calibration based on CO2 levels and barometric pressure conditions. In order to achieve a higher level of accuracy, the Series CDT includes digital barometric pressure adjustment and the ability to field-calibrate the sensor. For applications that require visual indication, the wall mount configurations of the Series CDT can be ordered with an integral LCD display. Push buttons are standard on all configurations of the transmitters for access to the menu structure, but wall mount configurations can be ordered without the buttons. To prevent tampering, the action of the buttons can be locked out using an internal dip switch selection.The SERIES GSTA & GSTC Carbon Monoxide/Nitrogen Dioxide Gas Transmitters monitor gas concentrations in mechanical rooms, underground parking garages and loading docks. The carbon monoxide transmitter is used to measure the exhaust of gasoline engines, while the nitrogen dioxide transmitter is used for diesel engines. The Series GSTA features field selectable current and voltage outputs while the Series GSTC features BACnet or Modbus® communication protocol, allowing gas sensing solutions that can be used with almost any building management controller.The SERIES RHP Temperature and Humidity Transmitter combine the voltage or current humidity transmitter output with a passive temperature thermistor or RTD output. Featuring polymer capacitance humidity sensors, models are available with 2%, 3% or 5% accuracies. Duct mounted transmitters are available with an optional two-line alpha numeric LCD display.The SERIES CDTV Carbon Dioxide / Volatile Organic Compound (VOC) Transmitter reduces energy cost in buildings by lowering the amount of conditioned air based on the occupancy of the space. By detecting both CO2 and VOC, the transmitter can also detect fumes that may need to be exhausted during lower occupancy periods. Combining both measurements in one transmitter reduces both labour and material costs by only having to install one CDTVVOC unit, instead of separate CO2 and VOC transmitters.The MODEL OSC-200 Omnidirectional Occupancy Sensor helps to automate building control systems. 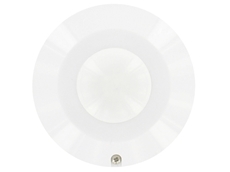 A spherical Fresnel lens provides a 360° detection zone with the use of infrared technology. The MODEL OSW-100 Wall Mount Occupancy Sensor is an infrared sensor designed to help automate building control systems. 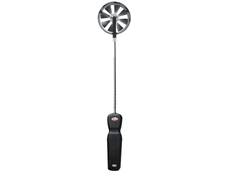 The Model OSW-100 has a wide 110° viewing angle to capture movement up to 49.2´ (15 m) away.APPLICATIONS Lighting control Building energy conservation HVAC applications in hospitals, schools, and commercial buildings Demand control ventilation Odour controlVisit their website for more information and product descriptions. Dwyer’s extensive range is functional and specified to many industries. The range includes: The SERIES PMT2 Particulate Transmitter is designed to measure particulate emission levels from dust collector discharge. Using DC coupled electrostatic induction sensing technology, the transmitter monitors a pA current that is generated as particulate passes near the probe; a 4 to 20 mA signal will vary based on the particulate level. The PMT2 offers 6 sensitivity ranges allowing the user to choose the range that will best fit the application. The range and test selector switch can also be set to output a 4 mA or 20 mA signal to assist with set up or trouble shooting. 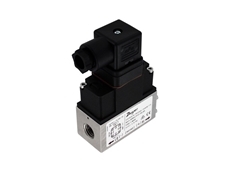 Averaging time setting can be used to dampen the signal if desired.The SERIES SVT Solenoid Valve Enclosure with Timer is a compact, reliable, and economic package that combines a timer board and solenoid valve enclosure into one package. Each model is available with 2, 4, or 6 valves, but expansion modules can easily be daisy chained for a maximum of 60 outputs.The SERIES DCT1000 Dust Controller Timer Controller simplifies on-demand cleaning requirements by eliminating the need for external devices such as pressure switches, relays, and timers. The modular design allows for use as a continuous cleaning control or on-demand cleaning control using the optional plug-in pressure module. The DCT1000 is the same size for 6, 10, and 22 channels, allowing one board size to be the standard on one enclosure.The SERIES DCV/RDCV Dust Collection Valves are ideal for use with the Series DCT1000 and Series DCT500 duct collection timer boards for controlling the air pulse in jet pulse type dust collectors to clean the filters. Both the Series DCV and RDCV have the option for either coupling or NPT connections. The coupling connection allows for a quick and simple installation. Only the stub pipe and blowtube need to be cleaned and deburred before the valve is fit into position. The “T” Series DCV has female threaded connections. Both the “C” and “T” versions have a 90° angle between the inlet and outlet the most suitable configuration for pulse valve applications. The design offers not only ease of installation, but also minimal airflow restriction for an exceptional cleaning pulse. The valves are offered in both integrated and remote coil configurations.Using solid state technology, the SERIES 3000MR & 3000MRS Photohelic® Switch/ Gages combine the functions of a precise, highly repeatable differential pressure switch with a large easy-to-read analog pressure gage employing the durable, time-proven Magnehelic® gage design. Switch setting is easy to adjust with large external knobs on the gage face. Gage reading is unaffected by switch operation - will indicate accurately even if power is interrupted. Solid state design now results in greatly reduced size and weight. Units can be flush mounted or surface mounted with hardware supplied. 3000MR models employ versatile electromechanical relays with gold over silver contacts - ideal for dry circuits. For applications requiring high cycle rates, choose 3000MRS models with SPST (N.O.) solid state relays. All models provide both low and high limit control and include 18-inch (45 cm) cable assemblies for electrical connections. Compatible with air and other non-combustible, non-corrosive gases, they can be used in systems with pressures to 25 psig (1.725 bar). Optional construction is available for use to either 35 psig (2.42 bar) or 80 psig (5.51 bar).APPLICATIONS Dust collection Pneumatic conveying Air conditioning systems Clean rooms Industrial vacuums Emissions monitoring Broken bag detection in dust collectors Filter leak or wear detection Bin vent monitoringVisit their website for more information and product descriptions. 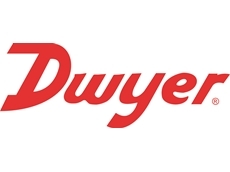 Dwyer, among many things, manufactures pressure transmitters and switches which are suitable for a variety of applications including HVAC, building automation, process control industries, dust collection and pneumatic conveying, food/beverage and pharmaceutical and general manufacturing markets.Dwyer’s extensive range is functional and specified to many industries. The range includes: Select the SERIES 2000 Magnehelic® Gage for a versatile low differential pressure gage with a wide choice of 81 models and 27 options to choose from. Using Dwyer’s simple, frictionless Magnehelic® gage movement, it quickly indicates air or noncorrosive gas pressures--either positive, negative (vacuum) or differential. The design resists shock, vibration, over-pressures and is weatherproof to IP67. Select the –HA High Accuracy Magnehelic® gage option for an accuracy within 1% of full scale. Also included with the –HA option at no extra cost are a mirrored scale overlay and a 6 point calibration certificate.The SERIES MS2 Magnesense® II Differential Pressure Transmitter combines the proven stable piezo technology and the versatility of our original Series MS with additional features to reduce installation time and simplify ordering. Like the original Series MS, the second generation transmitter can be used as a linear pressure output or a linear velocity output with the square root extraction done in the transmitter. Additional parameters have beeThe SERIES ADPS/EDPS/BDPA/BYDS Adjustable Differential Pressure Switch is designed for pressure, vacuum, and differential pressures. The dual scaled adjustment knob in inches water column and pascals allows changes to the switching pressure to be made without a pressure gage. The ADPS/EDPS/BDPA are available with settings from 0.08 in w.c. (20 Pa) up to 20 in w.c. (5000 Pa). The silicone diaphragm and PA 6.6 body make the series ADPS ideal for use with air and other noncombustible gases. Series EDPS models meet UL508 and are constructed of plenum rated plastics. The series BDPA Adjustable Differential Pressure Alarms offer a versatile range of configurations allowing utilization of their many features including buzzer and LED notification, and battery or line powered. The compact size, adjustment knob and low cost make the ADPS/EDPS/BDPA the perfect choice for HVAC applications.The SERIES 628 Pressure Transmitters are ideal for OEMs with 1% full scale accuracy sensors. 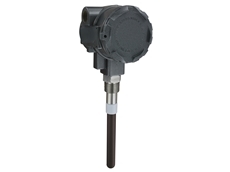 The corrosion resistant 316L stainless steel wetted parts allow the Series 626 and 628 transmitters to measure the pressure in a multitude of processes from hydraulic oils to chemicals. The Series 626 and 628 are available in absolute and pressure ranges with a variety of optional outputs, process connections and electrical terminations to allow you to select the right transmitter for your application.Replace your outdated analog gages with the new SERIES DPG Digital Pressure Gage. The Series DPG has a high ±0.25% or ±0.5% full-scale accuracy. The 4 digit digital display will reduce the potential for errors in readings by eliminating parallax error commonly produced with analog gages. 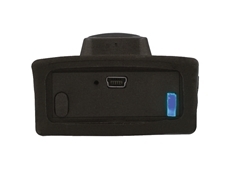 Series DPG is battery powered and has an auto-shut off to conserve battery life. Battery life, on average, will last 2000 hours. A 4 button key pad allows easy access to features without the need to work through complex menus or difficult key combinations. These features include backlight, peak and valley, tare or auto zero and conversion of the pressure units.APPLICATIONS Process applications Replacement for legacy analog gages OEM applications Compressors Pumping systems Irrigation equipment Hydraulic ApplicationsVisit their website for more information and product descriptions. Temperature limits: 32 to 123°F (0 to 50°C). Range: Volume Flow Rate Units: CFM, l/s, m3/hr. Volume Flow Ranges: Supply: CFM: 41 to 1176; l/s: 19 to 555; m3/hr: 69 to 2000. Exhaust: CFM: 45 to 1176; l/s: 21 to 555; m3/hr: 76 to 2000. Temperature limits: Compensated: 32 to 140°F (0 to 60°C); Process/Ambient: 14 to 140°F (-10 to 60°C). Temperature limits: Process: -20 to 212°F (-29 to 100°C); Ambient: 5 to 125°F (-15 to 51°C). Temperature limits: Ambient: 5 to 125°F (-15 to 51°C); Battery Charging: 32 to 113°F (0 to 45°C). 12/12/18 - Dwyer Instruments announces the release of the new Series 629HLP differential pressure transmitters recommended for monitoring differential pressure in various applications.The 629HLP is a high static, low differential pressure transmitter suitable for measuring overpressure or under-pressure conditions in air handlers, heat exchangers, chillers, and hydraulic systems. Key features of Dwyer’s Series 629HLP differential pressure transmitters include IP65 rated enclosure providing a robust exterior; compact and lightweight assembly allowing for trouble-free installation; ability to detect a low pressure differential across high-static pressures, improving measurement accuracy and allowing the system to react quickly to changes; integral dual pressure sensors able to convert pressure sensors into a customer-selected 4 to 20 mA or 0 to 10 VDC output signal; and ranges available up to 6 bar (90 psi) with accuracy up to 1% full-scale.To learn more about the Series 629HLP, please visit the Dwyer Instruments website. 20/04/15 - Dwyer Instruments has introduced a new app that converts Android based phones and tablets into a multi-function test instrument for HVAC applications.The new Mobile Meter Software Test Instrument Mobile App works with most Android and iOS phones and tablets as well as wireless probes.Wireless probes connect to the phone or tablet using Dwyer’s mobile gateway, Model UHH-BTG that utilises Bluetooth technology. Parameters from multiple probes can be displayed simultaneously, or a single probe’s parameters can be displayed as a meter or analogue gauge. With one touch data logging, measurements from a single probe can be saved to log files for future use. The log files can be viewed directly on the phone or emailed to another device or computer. 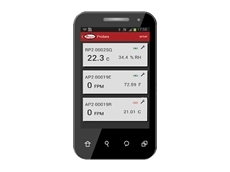 The Mobile Meter Software Mobile App also performs conversions for engineering units as well as calculations for flow or air velocity conversions.Dwyer Instruments was recently recognised for excellence in product design at the 11th annual Dealer Design Awards Program sponsored by The Air Conditioning Heating & Refrigeration News magazine. Dwyer’s Mobile Meter Software Test Instrument App won the Gold Award in the Testing and Monitoring product category. The Mobile Meter Software Mobile App is available for download in the Google app market. 30/06/14 - Dwyer Instruments introduces the new Series CDTA communicating carbon dioxide, humidity and temperature detectors designed to combine multiple parameters in a single compact device.The Series CDTA combination sensors enable carbon dioxide, humidity, temperature, occupancy override, and temperature set point measurements in the same device. 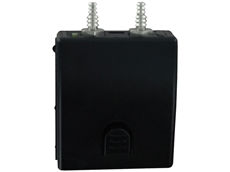 Series CDTA sensors reduce installation and wiring cost, and also require less I/O on the controller leading to savings in additional hardware costs.The measurements are transmitted through field selectable BACnet or Modbus communications to the building controller, allowing for transmitters to be daisy chained with other communicating sensors. Carbon dioxide measurements are taken using the in-house single-beam, dual-wavelength Non-Dispersive Infrared (NDIR) sensor, while humidity measurements are measured using a capacitive polymer sensor and the temperature is recorded by a solid state band gap sensor. Series CDTA sensors allow temperature set point and override to be locally configured using the buttons on the side of the detector and the optional integral or remote LCD. 29/04/14 - Specialist provider of a complete range of practical and affordable instrumentation, Dwyer Instruments announces the release of its new Series WD3 water leak detectors.Designed to prevent water damage to equipment, Series WD3 water leak detectors detect the presence of water in drip pans in air handler units, under raised floors in data centres, or on floors around sump pumps and drains. Water is detected once it reaches a level that bridges the two conductive strips on the bottom of the detector’s housing. Audible and/or visual alerts depending on the detector model will provide local indication of the alarm condition with an internal switch giving remote indication or control to prevent further build-up of water. 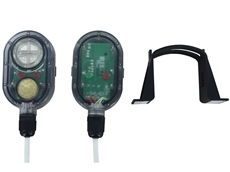 Series WD3 water leak detectors are also available in a battery powered version, the Model WD3-BP-D1-A, for applications where power is not available. The battery is powered using a coin cell 3V lithium battery. Either AC or DC supply voltages can be used to power the water detector in general conditions. The sensing height can be adjusted to as low as 1/32” using the adjustable mounting bracket.